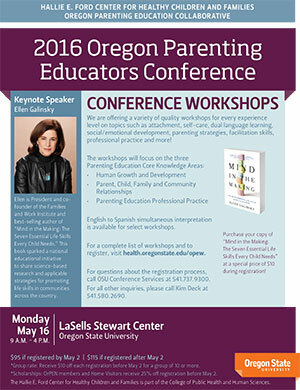 The third annual Oregon Parenting Educators Conference will be held at Oregon State University from 9 a.m.–4 p.m. Monday, May 16, at LaSells Stewart Center. The Hallie E. Ford Center for Healthy Children and Families and the Oregon Parenting Education Collaboration are hosting this year’s event. Ellen Galinsky, president and co-founder of the Families and Work Institute and best-selling author of “Mind in the Making: The Seven Essential Life Skills Every Child Needs,” will be the keynote speaker. Conference workshops will cover a broad range of topics of interest to professionals of all skill levels who work with families. This year’s core knowledge areas are human growth and development; parent, child, family and community relations; and parenting education professional practice. Additional focus areas include home visitors, early childhood care and education, serving cultural or ethnic minority parents and working with pregnant or parenting teens. A full list of workshops, skill-level recommendation and focus areas is available here (PDF). “Ongoing professional development for parenting educators is critical because research has shown that the quality and delivery of parenting education programs contribute to positive outcomes for participants. Professional development opportunities allow parenting educators to stay updated on the latest research and strategies for engaging families,” says Denise Rennekamp, parenting education program coordinator at the Hallie E. Ford Center for Healthy Children and Families. Denise adds that past studies pointed to limited opportunities for parenting educators in Oregon. Financial support from The Ford Family Foundation and CPHHS alumna Cheryl Lutz has made professional development opportunities, such as the Parenting Educators Conference, more accessible to educators. If you are interested in attending the workshop, please see registration and additional conference information. Group rates and scholarships are available.